I am an artist. The end. I am an artist (it’s taken me a while to own it). My official first art project was the Magnificent I Love You Mom Hair Plate. I’ve had 40 years to ponder how my creative spark and heartfelt expression of love could ever have been misunderstood. I am an artist (my art is for me, and it’s just my cup of tea). I’ve learned to appreciate my wanting to be unique and different and I celebrate this about myself. I understand that I must make art that sings to my soul, art lights me up from the inside. I must be true to myself and honor my own vision. I am an artist (and not everyone agrees). Most of my life I have been expressing my love and passion through one medium or another. As a kid, I remember trying to squeeze the emotion I felt into the piece I was making and part of what I loved about it was doing it differently. I remember being corrected, again and again – there’s a right way to sew, a right way to draw, a right way to use the scissors, right places to put the glue. There is even a right hand, and it’s the right one. I am an artist (I don’t want to make the art everyone else is making). Kindergarten, just before Mother’s Day – my teacher was leading our class through this pressed hands mother’s day thing (boring!). The example looked like a mausoleum plaque. RIP. Why would I give THAT to my mother? So there I was, trying to figure out how to mix some glitter into the plaster to make it look happy when the lid to the glitter fell off and the entire jar of green glitter dumped into the plaster. I was frantically stirring, hoping my teacher wouldn’t see. No chance. With a what do you think you’re doing, she whisked my project into the garbage. No mother’s day present for you! But how was me trying to be original a bad thing? I don’t want to make art like everybody else. I sat through the rest of the kids making their hand stamp plates and dreamed up my own gift for mom. I am an artist (my joy comes from the process of creating). My gift needed to be unique and special, something that might make her realize my preciousness and maybe even love me a little more. Once I had the idea of the Magnificent I Love You Mom Hair Plate, I couldn’t wait to get started. I gathered my materials: a paper plate, the scissors, some glue and a red crayon. I could just visualize how blown away she was going to be by my amazing and unique artwork. I wrote the message on the plate that we had learned in school: Happy Mother’s Day Mom! I love you, Robin. I then cut off most of my hair (just grabbed it all to the front and sawed away with my scissors). I put the glue onto the plate, and artfully arranged the hair. As the finishing touch, I wrapped the whole thing with saran wrap. It was a freaking masterpiece!! I could not wait to give it to her. I could just imagine her face as she opened it! 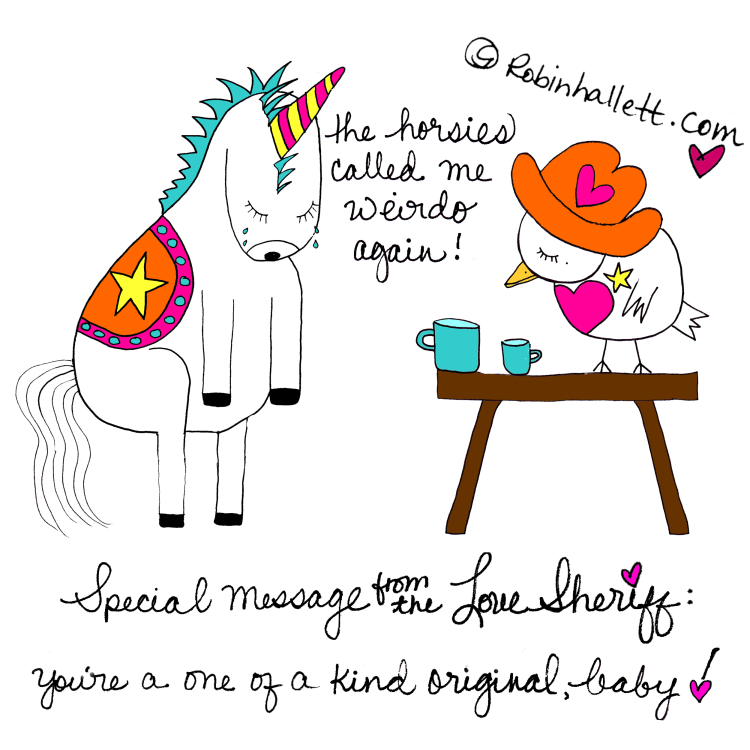 For you, Mom…from ME your super awesome and totally cool daughter whose creations are unique. 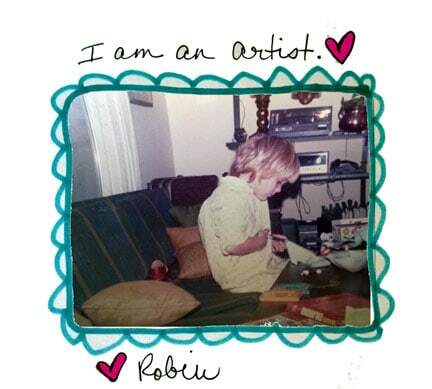 You are the recipient of a Robin original! I am an artist (it’s okay if you don’t get it). It was the kind of present that couldn’t wait for mother’s day. I mean just one look at me and the cat would be out of the bag. But how to spring it all on her? I decided to go for the dramatic effect. I sat on my bed, back turned from the door, plate in hand, and called for mom to come to my room. She was gonna be so surprised! When she arrived, I turned around and presented my masterpiece to her. Ta-da! Did she not get what I was going for here? My artistic vision? She slapped me, What did you DO?! I am an artist (I am the one who decides, not you). Who is the decider and permission granter in the great Am I an Artist Debate? I am. I’m the decider and permission granter. I am an artist. And I alone define what artist means to me. I rejoice as I create. I put the love into my work. I feel excited and delighted by my creations. I feel like I am living the best life ever when I create. I am expressing my spark as I go and I love it. I feel the juice in my bones while I work. I feel on-mission and on purpose as I create. Yes, this is how I notice I am an artist. I come alive as I create. OF COURSE, it broke my heart. And yes, it felt like she trampled all over my beautiful intention of love and creativity. But something inside me couldn’t be stomped out completely. Even then, I knew she just didn’t get it. You are an artist too. But don’t take my word for it. Have you decided and given yourself permission? Have you named and claimed it for yourself? If not, what is that costing you? When you ignore your own creative impulses because you haven’t given yourself permission, you end up hurting your own feelings. You stifle the greatest power that wants to flow through you. Yes, it’s a great power that can heal anything, and when you allow it to flow, we all benefit. All of those stories people tell me in session, But I’m not an official artist, I’m not an actual healer, I’m not a real writer, are wobbly reinforcements to the wounded inner one who is asking to be healed. And, do you know who needs to offer the healing? YOU. Nobody but you. 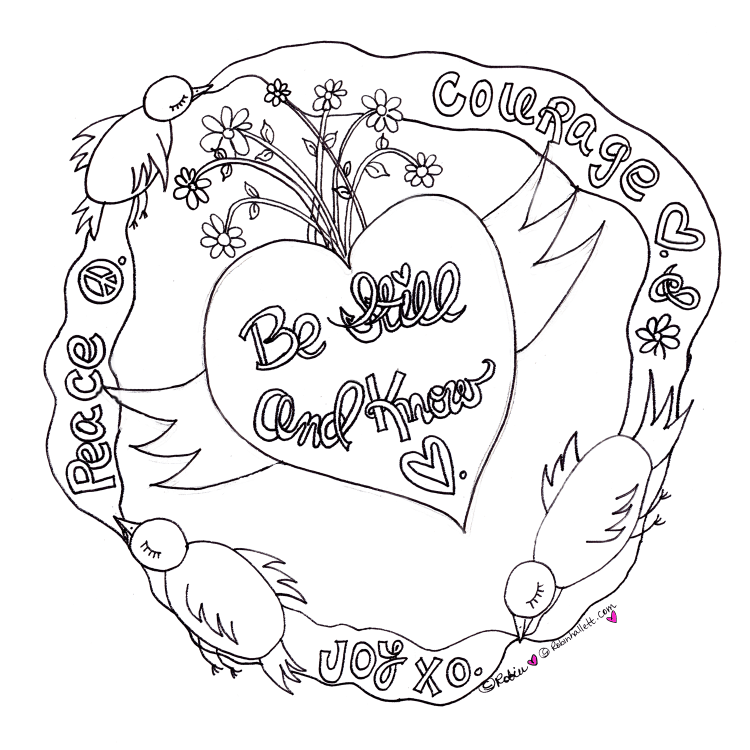 It takes less time and energy for us to be courageous than it does to remain fearful. You gotta name it and claim it. I am an artist and so are you. I am an artist. I am a writer. I am a healer. I am a soul soother. I am an inner demon hugger. I am a child of God. I am a spark of the Divine. What are you?